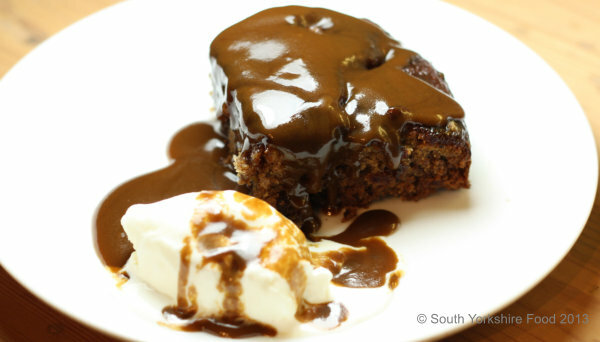 Sticky, gooey, and sumptuous - this recipe is the business! Originally invented at the Sharrow Bay hotel in the Lake District, this dish has become famous all over the world. This recipe is a variation created by Nigel Barden and it is superb. Serves 4 most generously or 6 who will want more! First boil and then weigh the water - weighing is a lot more accurate than using a measuring jug. Carefully add the chopped dates and bi-carbonate of soda (use a large container as the bi-carbonate of soda will make the water fizz up) and leave to soften for around 10 minutes. Using the paddle/beater attachment of your mixer, cream the butter & golden caster sugar until they lighten slightly in colour - approx 5 minutes. Add the vanilla seeds (or extract if using) and turn the mixer down to its slowest speed. Pour the mixture into a buttered and floured 20cmx20cmx6cm square baking dish and bake at 180C or 375F, gas mark 5 (170C for fan ovens) for 30-40 minutes - a knife inserted should come out clean. Meanwhile place the double cream, black treacle, de-seeded vanilla pod and dark soft brown sugar in a pan, stirring occasionally, bring to the boil and switch off heat.